High-precision pressure reducing valves with built-in separator & trap. Small capacity pressure reducing valves with built-in separator & trap. 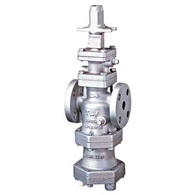 In addition to pressure reduction, these valves also provide steam trapping and condensate separation functions. Self-aligning capability, shock-absorbing spherical piston, and advanced pilot regulator design all work to accurately maintain secondary pressure stability. Built-in Cyclone Separator provides a condensate separation efficiency as high as 98%, and self-modulating Free Float® steam or air trap provides dry, high-quality steam or air. Built-in separator and trap make for simple piping arrangement, and internal secondary pressure-sensing channel (optional in some countries) makes external sensing line unnecessary. Because of its ability to stabilize secondary pressure and its condensate removal function, it is suitable for steam or air processes.